I’ve just got off the phone after talking to Andrew Simpson, the civil servant leading the redevelopment of the DCMS intranet. I’ve never met Andrew face to face, but I look forward to doing so, because he and his tiny team deserve a big thank you. 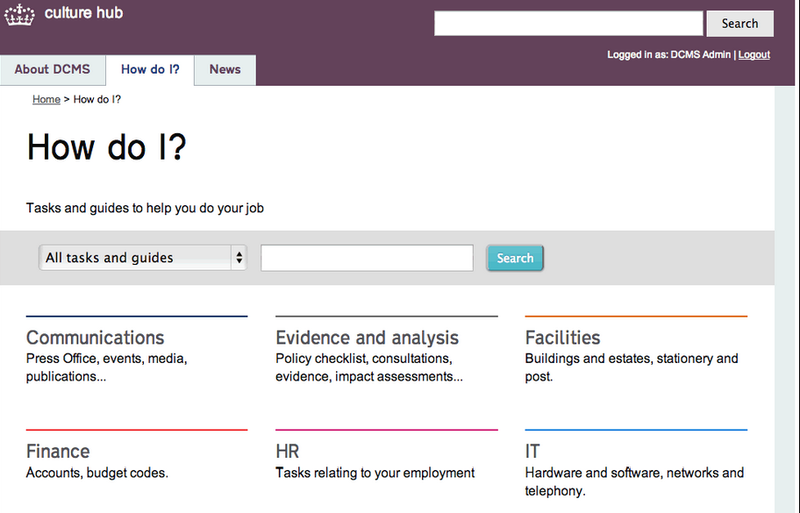 They have just created the exemplar for a government intranet in 2013. To learn much more, read these two blog posts from Luke Oatham, a developer from Helpful Technology, the SME partner commissioned via G-Cloud. As you’ll see if you read Luke’s excellent posts, those DCMS staff already using the beta enjoy a simple, clear, fast experience. They get an intranet designed to understand and meet their needs, delivered swiftly and cheaply, and set up from the word go to iteratively improve based on their feedback. 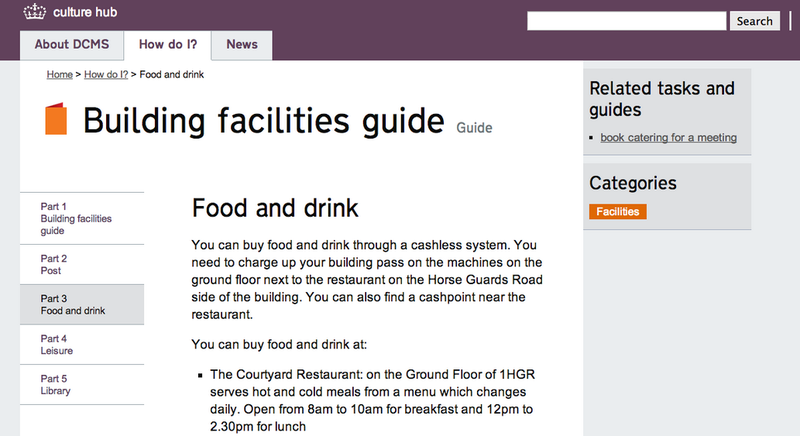 The team reused the design patterns and formats established by GOV.UK. They prioritised on the most important user needs. They wrote for the web, using the style guide. They designed the site to be responsive to different screen sizes, using open standards. They launched the beta early, despite knowing it still had rough edges, because nothing beats real feedback from real users as early as possible. In short, they used the same process espoused in the new Government Service Design Manual. They will remove the beta label and turn off the existing intranet in the coming days. And all delivered using open source software (WordPress) for a fraction of the previous cost. And I mean a fraction. Developing the new intranet cost £15k. The monthly hosting, support and iterative development cost is in the hundreds of pounds per month, less than a tenth of the monthly hosting cost of the intranet it replaces. That’s a 90% saving – the new normal. Andrew, his team and their supplier have set the new benchmark for government intranets. They really have raised the bar. 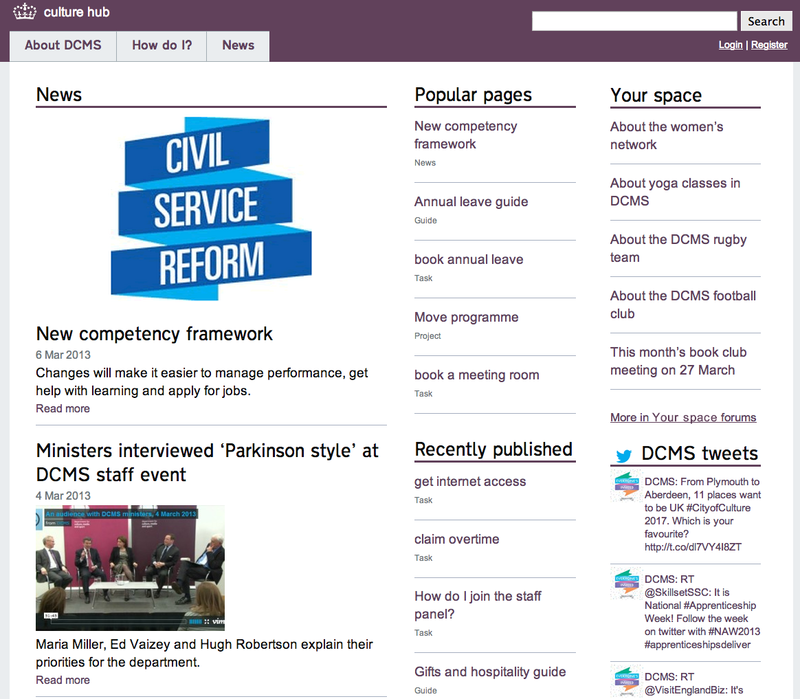 Anyone inside the civil service thinking about redeveloping their own intranet should talk to DCMS first. When Mike Bracken talks about a new dominant culture, this is it in action. Posted on March 18, 2013 by Tom Loosemore. This entry was posted in GDS. Bookmark the permalink.